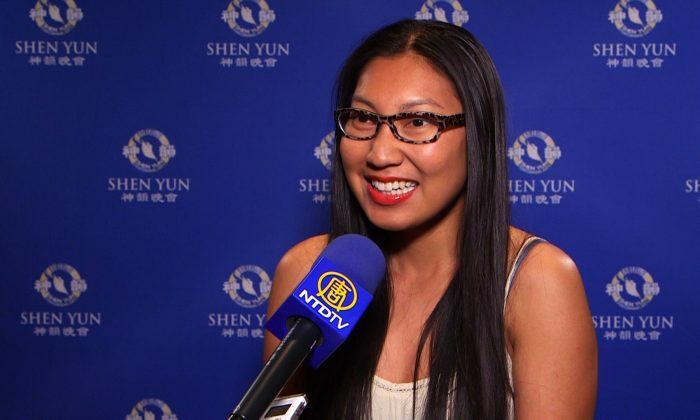 PHOENIX—Independent fashion designer Yvonne Ung was not only inspired by the costumes in Shen Yun to which she paid particular attention when she attended the performance on the evening of April 6; the music “is amazing. It makes me feel like I’m in a palace,” she said, explaining how the experience was uplifting on a deeper level. “I am inspired because sometimes I can have a heavy heart, and seeing things like that just brightens my day. It makes me feel light-hearted. I feel happy, and the people, the dancers are so incredibly, incredibly talented,” she said. This year Shen Yun celebrates 10 years since its inception when it set out to revive China’s 5,000 years old civilization with deep spiritual roots. A Shen Yun performance weaves a “tapestry of heavenly realms, ancient legends, and modern heroic tales” according to the company’s website where one can also glimpse some of the spectacular dances, colors and backdrops, and listen to the sounds of the Shen Yun orchestra, which also tours independently. Apart from imperial court robes and colorful costumes worn by the characters in story-based dances such as the “Monkey King and Dragon Palace,” there are also ethnic dances that pay homage to the many distinctive ethnic groups within China and around her borders such as Tibet and Mongolia. “I just didn’t think it would be so bright and colorful. There are lots and lots of movement. The costumes are very detailed with every seam, every line —it’s perfect. The hair styles, the shoes with the little heels—amazing, fabulous,” said Ms. Ung. She was left longing for clothes similar to the ones worn by Shen Yun’s performers. “I love the performance. It’s absolutely beautiful. I want to make clothes—I want to wear clothes—like that every day. It’s so inspiring. It’s bright and beautiful,” said Ms. Ung. “I cried, I cried. I don’t know. It gets to you. It touches my heart. That’s all I can say. Everybody has to come and see this. They really do,” said voice-over artist at KFNX radio Michael O’Connor, when he attended Shen Yun in Phoenix. He had done an on-air commercial for Shen Yun at KFNX radio but was still very surprised at all the elements that came together during the performance. Mr. O’Connor was thinking to see the show again when he found out that April 6 was the company’s last performance in Phoenix, with shows following throughout April in California. The New York-based Shen Yun Performing Arts is comprised of four touring companies. They produce an all-new show every season and tour with it around the globe. Among the things that Mr. O’Connor mentioned about the performance were the music and the animated backdrops: “The way they synchronize the actors with the backdrop, I’ve never seen that before. That is amazing,” he said.